When I first saw the subject of Summer for the second Twinchie challenge I didn't think I'd be entering anything. I'm not quite sure how it came about but I found myself thinking about looking into a rock pool to find shells - a typical summer pastime when holidaying by the sea &, since I had a vague recollection of seeing some kind of shell tangle somewhere, that's where I began. 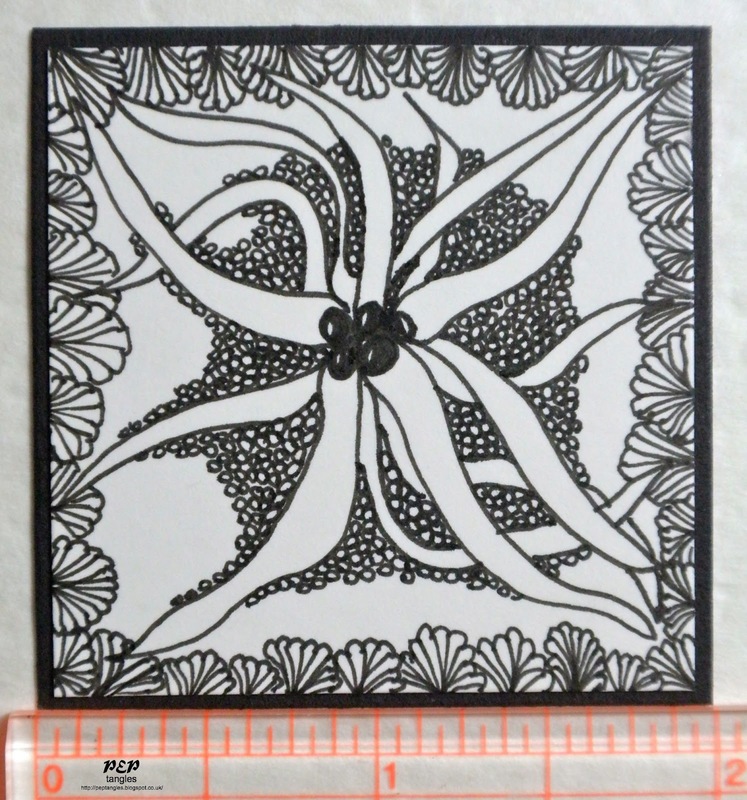 I recently ordered the Official Zentangle® Kit from TanglePatterns.com run by Linda Farmer as I was particularly attracted by the idea of the 20-sided die & Zentangle Legend™ that it contains. At the moment Linda includes an interactive e-book (emailed as a pdf file) of official tangles with purchases from her site. As I've already received the pdf file I printed it out & had a look through. It's a lovely comprehensive graphic guide - as is Linda's web site which I find myself turning to as well as the Suzanne McNeill books. Imagine my delight when I saw several shell patterns & then stumbled upon this rather magnificent squid. So here I am entering a tangled Summer Twinchie after all - I do hope it is acceptable to enter tangled Twinchies as I can see me doing this upon a regular basis now that I think there might be a way of interpreting the challenge themes. Well done for that bit of lateral thinking on the summertime challenge. This is another great tangle. Hi Paula, tried to post a comment yesterday via iPhone - failed miserably. 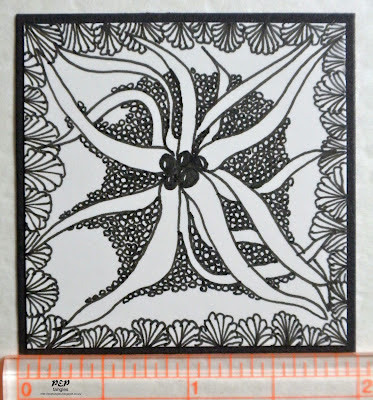 I think this is a lovely tile and I just love the Sanibelle tangle, squid is so appropriate as well. Nice one. WOW - this is a brilliant Tangle Twinchie and I think it's perfect for the theme. I drew my first Mooka Tangle today . . . quite pleased with it. This is a fabulous entry for the challenge Paula. I can see you are really getting to grips with this particular style of art. i've been interested in twinchies - glad to see one here! i'll have to check out this challenge site. what do you work on? do you use regular sized paper? or do you just block a 2" square on your paper?